Last week, my beloved ipod finally kicked the bucket. When it died, it took a small piece of my soul with it and I had a good cry over it (seriously). My ipod is pretty much attached to me, along with my computer, so it was seriously upsetting. Luckily for me, my parents love me greatly. Two days later, a brand new ipod was sitting on the coffee table waiting for me to find it when I woke up. Not only is it newer and shinier, it holds nearly 6 times the music my old one did. (Mine was over 4 years old.) I have to pay them back, but they gave the whole year to do so! So now that I have this amazing new device, I must protect it and keep it beautiful and perfect. I browsed online stores for skins, but they all bored me. So I whipped this up tonight since I can't sleep. Of course, it is a yeti. What else would it be?? I hope ya'll like it! 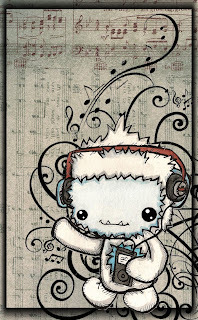 I will have all my designs on there, and you can get stuff like this cute little yeti on bags, mugs, shirts, sweatshirts, etc. I am taking requests too! This is Waddell. Waddell was drawn in August 2009 out of boredom, but he won my heart instantly upon completion, and spawned an obssession that not one person could have predicted. lol...I drew this yeti and made an entire little collection of cryptid characters which were framed in a giant collage pieced frame for our county fair art show. I only made a it few hours before the deadline, but somehow it won first place. It had a ton of characters, but I just fell in love with this one. Since the show, I have taken apart the whole thing, and used the character in other pieces, or decorated my studio with them, saving them for something special. But I had this one set aside, so the other day, I decided he needed to be framed since he literally started my obession with yetis. He now sits on a shelf surrounded by a myriad of other yetis which you shall see shortly! "An early record of reported footprints appeared in 1889 in Laurence Waddell's Among the Himalayas. Waddell reported his guide's description of a large apelike creature that left the prints, which Waddell thought were made by a bear. Waddell heard stories of bipedal, apelike creatures but wrote that of the many witnesses he questioned, none "could ever give ... an authentic case. On the most superficial investigation it always resolved into something that somebody had heard of." To make up for my absence in the last few days, I will be posting tons today and tommorow! First up: some yeti goodness as promised. This was the original cabinet I made that inspired the bigfoot one for myself. It went to Robbinzombie of craftster in exchange for what else? 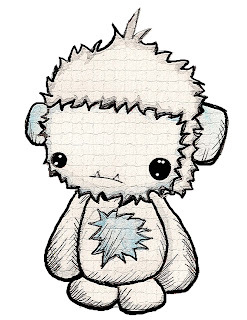 A plush yeti, of course! I am making two more of these cryptid cabinets for sure! I have one almost completeled for the greatest cryptozoologist of them all, Loren Coleman! And then I am making my own yeti one out of a barbie piece of furniture. But that is all I will say for now, because the new yeti one will have a twist to it!! Since I already have a cabinet, I had to rethink one. 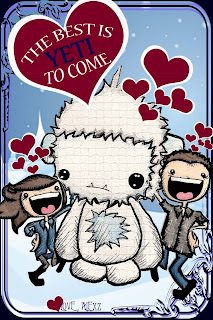 Stay tuned, I am going to post my entire yeti collection for (mostly for Henry and Raven to see!) but since I now have a new yeti friend, I have to take some new pictures tomorrow during daylight. Okay, blogger has been giving me some major problems with pictures. Sorry about the absence! Hopefully these pictures are showing, but if not, please let me know! It takes awhile for me to upload them, so for now, I have a smaller post of my Valentine's gift. 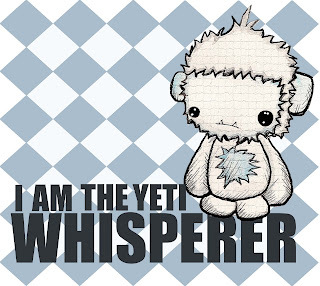 But tomorrow night, when I have more time, I have a major yeti post coming for you all! MAJOR. Until then, enjoy my Valentine for Kevin, my fiance! It was quick gift, but oh so fun and special!! Everything is made from recycled material found around the house and leftover scraps of paper, so I spent no money on this whatsoever. It turned out pretty cute, I thought! It also has some hidden meanings. The little charm with the snow flake represents our song, Love Like Winter, by AFI, which is the song Davey Havok, the lead singer of AFI dedicated to us; Kevin proposed to me to at their concert and had the band in on it! The Mickey Mouse charm represents how we met. I wear a Mickey Mouse watch everyday that I have worn since I can remember. He noticed it one day and asked me if I had read The Da Vinci Code because of a reference to a Mickey Mouse watch and that led to a 3 hour long conversation. And then the quote: "If I gotta be damned, you know I wanna be damned, dancing through the night with you." Upon our first meeting because of the watch, I also just happened to be drawing a picture of Meat Loaf, my hero, on my biology notes. Kevin now has it framed. So Meat Loaf brought us together! And then the dancing quote fits for the fact that we dance in the living room Pulp Fiction style almost every night. lol. Freaks. Add some candy and some adorable crocheted turtles made by my amazing friend Shannon and voila! Valentine's Day! I hope you all had a wonderful love day! I will be posting a bunch of yeti stuff tomorrow, possibly even tonight, so in honor of that here is my favorite commercial ever.